Epoxy Oilserv Limited as m ajor distr ibu tor s of Mar ine coatings and paints. We have a large stock of different brands of marine paints and other coating products. Our Marine and Protective Coatings are high quality paints, and are of the few quality brands for coatings approved worldwide and in Nigeria for the protection and maintenance of steel infrastructure and to enhance the life span of concrete structures. Our marine paints provide protection for Industrial machinery, steel, wood, ship bottoms, tanks, pipelines, concrete ship decks in harsh environment against corrosion, chemical attacks, weathering, fouling, abrasion, heat carbonation and contamination. We have large products such as Sigma, Jotun, International, Hempel paint and branches located in the major cities of the country. We supply to offshore and onshore locations. PROTECTIVE COATING A protective coating is a layer of material or covering that is applied to the surface of a structure or material usually referred to as the substrate. Protective coating is applied to substrate to protect the substrate from rust, decorative/ beautification purposes, prolong the lifespan of the substrate and to add some functionality to the object Features of Protective Coating or surface. Products Chemical Resistance: The coatings Applications of Protective Coating especially epoxy coating or paints must Products resist breakdown from the chemicals to Applying a decorative coating or which it is exposed. painting transforms the appearance or Water Resistance: Water affects virtually the beauty of substrate. all coatings. Greater water resistance Anti corrosive paint or coating products equates to more effective corrosion control. are used to protect structures from Ease of Application: Ease of application is corrosion a vital characteristic, especially with Certain coating products offer intricate structural details. The more protection from fire outbreak and to difficult the resist heat flow. application, the more opportunity for Provide protection from abrasion and defects to be created, leading to premature chemical attack, especially epoxy paint failure. or epoxy coating. Impact Resistance: The coating may have to Protects substrate from UV light and resist impact loads. other environmental factors. Abrasion Resistance: Coatings in some Coating of pipelines, vessel parts such as areas may have to be abrasion-resistant. super structures, interiors, exterior Temperature Resistance: The environment parts and engine room etc. may expose the coating to extremes of temperature. Features of Protective Coating Dielectric Strength: A key variable in the Products barrier coatings and when using coatings in conjunction with cathodic protection. Most vinyl paint is opaque and does not Types Of Protective Coating easily come off the surface. However, some Products/Paint surfaces resist the application of vinyl paint. There are many different formulas for vinyl paint, all designed for specific tasks. Good chemical resistance. Good water resistance. Quick drying. Not temperature dependent. One-component Limitations  Low solid content. Alkyd paints are mostly used for  Poor resistance against strong solvents. decorative purposes and for protection  Dry heat resistant up to approximately of steel exposed to relatively mild 80oC. environments. Alkyd paints are made  High content of volatile organic compounds from alcohol and acid with the (VOC) addition of fatty acid or oil. They have poor resistant to water and chemicals as such cannot be use below the water Chlorinated Rubber Coating Chlorinated rubber paint is just one of many level and it should not be use for zinc coatings available for surfaces, widely used primer. in the commercial, industrial, agricultural, Good wetting properties: leisure and healthcare sectors. Chlorinated  Good adhesion to the surface, and rubber coatings are one-component and dry good penetration properties. by evaporation of the solvents. They are  Good weather resistance. therefore not so sensitive to the ambient  Good levelling properties temperature during application and drying. Vinyl paint one-component paints, mostly used for industrial applications. It has good resistance to water, some level of resistance to chemicals and has traditionally Vinyl paint is a water-based paint been used on ships and other marine containing vinyl plastic that is structures both above and below the designed to stick to surfaces such as siding, floors, plastics and seat covers. waterline. Polyurethane paint majorly used in an epoxy The vinyl paint soaks into the surface system. Polyurethane can be one or two of the material, becoming part of the component. Two-component polyurethanes original surface. are among the most common coating types. They fill a vital niche for high-performance applications over metal, concrete, wood and plastic. Polyurethanes are mainly used as topcoats in an epoxy paint systems. It has excellent colour and gloss retention for outdoor exposures. In addition, they are resistant to chemicals and solvents. A polyurethane coating can protect the base material from corrosion, weathering, abrasion and other processes that would degrade the material over time. Epoxy mastic paint epoxy mastics are made from epoxy resin modified with a hydrocarbon resin and a curing agent. The job of the hydrocarbon resin is enhancing the moisture resistance, flexibility and the wetting properties of epoxy coatings. Majorly used for coating of marine structures below and above the water line because of their high resistance to water. Inorganic Zinc Coating An inorganic zinc coating provides high protection from corrosion to surfaces such as steels. This type of coating has large amounts of zinc metallic dust mixed with a binder. Inorganic zinc coatings are very resistant to different chemicals especially solvents. Used as primers they have the ability of providing cathodic protection. This will contribute to protecting the steel substrate and reducing the risk of having undercutting corrosion. Organic Zinc Coating Organic zinc rich coatings are used by many industries to protect steel structures from corrosion. They are anti-corrosive primers used to protect iron and steel surfaces. The binder used in an organic zinc rich coating is often epoxy. Zinc epoxy is often used as a holding primer both at industrial plants (during maintenance) and within shipping. It is quick drying and the over coating interval is relatively short. It also enables cathodic protection. The main reason for applying a zinc containing coating is to have a primer with the ability of providing cathodic protection. For the cathodic protection process to work properly, it is extremely important that the coating contains a sufficient quantity of zinc metal in its formulation, usually above 75% weight of the dry film for waterborne and 82% for solvent borne paints. Paints in Stock Jotun Paint The Jotun Group is one of the leading paint manufacturers globally. The company has 40 production facilities in 24 countries, 64 companies in 45 countries and is represented in over 100 countries around the world. Jotun has a long history of developing and manufacturing high quality, cost efficient and environmentally compliant paints and productive coating products. 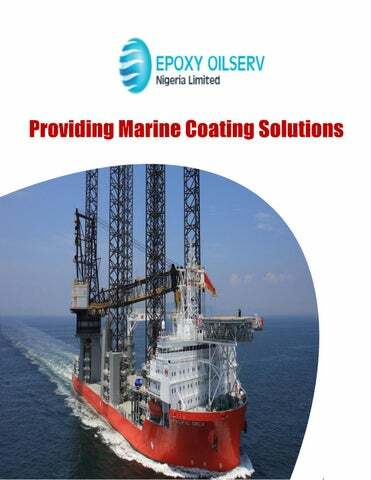 Epoxy Oilserv Limited is a major distributor of the jotun products in Nigeria. Some the products we have in stock are listed below. ALKYD PRIMER  This is a one component oxidatively drying alkyd coating.  It can be used as primer or mid coat in atmospheric environments.  Suitable for properly prepared carbon steel, aluminium and wooden substrates.  Recommended for touch-up purposes.  Suitable for a wide range of industrial structures.  Can be applied to any surface of new or aged coatings in atmospheric conditions.  Available in black, grey, light grey, red, white drying. RED OXIDE PRIMER  Red Oxide Primer is a rust preventing primer based on a special synthetic resin.  Recommended use for use on steel structures can be use on other substrate.  The temperature of the substrate should be minimum 3ºC above the dew point of the air.  Temperature and relative humidity measured in the vicinity of the substrate.  Good ventilation is usually required in confined areas to ensure correct drying. Jotamastic 80  This is a two component polyamine cured epoxy mastic coating.  It is a surface tolerant, high solids product.  Specially designed for areas where optimum surface preparation is not possible or desired.  Can be used as primer, mid coat, finish coat or as single coat system in atmospheric environments.  Suitable for properly prepared carbon steel and aged coating surfaces. Jotamastic 87  This is a two component polyamine cured epoxy mastic coating.  It is a surface tolerant, high solid, high build product.  Specially designed for areas where optimum surface preparation is not possible or desired.  Provides long lasting protection in environments with high corrosivity.  Can be used as primer, mid coat, finish coat or as single coat system in atmospheric and immersed environments.  Suitable for properly prepared carbon steel and aged coating surfaces.  It can be applied at sub zero surface temperatures.  Primarily designed for maintenance and repair. Marine: Outside hulls, exterior and interior areas, including water ballast tanks. Hardtop xp  This is a two component chemically curing aliphatic acrylic polyurethane coating.  It has a glossy finish with very good gloss retention and high solids product.  It has good application properties with low dry spray.  To be used as topcoat in atmospheric environments.  Recommended for topside, deck and superstructure.  Recommended for offshore environments, refineries, power plants, bridges and buildings.  Suitable for a wide range of industrial structures.  Used as a topcoat in pre-qualified NORSOK systems. Penguard fc  A two components, polyamide cured, high molecular weight epoxy coating. It has a semi gloss finish with fair gloss retention.  Can be used as primer, finish coat or as single coat system in atmospheric environments or as a final coat in immersed environment.  To be used as topcoat in atmospheric and immersed environments.  Recommended for all non immersed areas and areas immersed in seawater.  Suitable for a wide range of industrial structures.  Should be use with thinner 17. Pilot 11  A one component oxidatively drying alkyd coating.  It has a glossy finish with good gloss retention.  To be used as topcoat in atmospheric environments.  Recommended as topcoat, and for touch-up purposes.  Recommended for engines, topside, deck and superstructures  Should be use with thinner 2 Pioner topcoat  This is a one component physically drying acrylic coating.  It has a semi gloss finish with good gloss retention and fast drying.  To be used as topcoat in atmospheric environments.  Recommended for topside and superstructure.  Suitable for a wide range of industrial structures.  Apply with Thinner 7. Marathon  This is a two component polyamine cured epoxy coating.  It is a high solids, high build, and glass flake reinforced product.  It is scratch and abrasion resistant. Suitable for environments with very high corrosivity.  Can be used as primer, mid coat, finish coat or as single coat system in atmospheric and immersed environments. protection as part of a complete coating system.  To be used as primer in atmospheric environments.  Suitable for carbon steel, repair of inorganic zinc silicate coating and damaged galvanised steel substrates.  This product complies with ASTM D520 type II zinc dust. S  Suitable for exterior exposure in offshore environment, below 120 °C.  Suitable for structural steel and piping exposed in corrosivity categories up to CX (ISO 12944-2).  Recommended for offshore environments, refineries, power plants, bridges, buildings, mining equipment and general structural steel.  Specially designed as a primer for coating systems where extended durability is required. INTERNATIONAL PAINT Interprime 198  A quick drying, one pack primer. Interprime 198 is surface tolerant.  Compatible with most substrates and can be over coated with a wide range of finishes.  For the maintenance of above water areas.  Approved for the carriage of grain when used as part of an approved scheme.  For use at Maintenance & Repair or On Board Maintenance.  Available in 20L and 5l , colour – white, grey and red. Interprime 820  Interprime 820 is a high-performance 2-component epoxy primer.  With inert pigments, extenders and anti-corrosive protection, it’s suited for use on a range of substrates above and below water.  Suitable for above the waterline – Bilge, Lockers, Exterior cabin/trims, fresh and sea water. Interzinc 52  International Interzinc 52 is a two component, metallic zinc rich epoxy primer which complies with the composition and performance requirements of SSPC Paint 20.  It has been designed to provide excellent corrosion resistance in both maintenance and new construction situations. Interzinc 22  A two component, rapid recoat, fast curing solvent based inorganic zinc rich ethyl silicate primer.  Suitable for use with a wide range of high performance systems and topcoats in both maintenance and new construction of bridges, tanks, pipe work, offshore structures and structural steelwork.  Interzinc 22 can also be used as tank coating suitable for the carriage of different chemical cargoes (e.g. styrene) according to International Paint’s chemical resistance guide.  Provides excellent corrosion protection for correctly prepared steel substrates, up to temperatures of 540°C (1004°F) when suitably top coated.  Fast curing primer capable of application in a wide range of climatic conditions. Interlac 665  A one pack alkyd gloss finish. For use as an easily maintained cosmetic finish coat on areas above the waterline.  For use at new building, Maintenance & Repair or On Board Maintenance. It comes in different colours. Intergard 269  This is fast drying two component epoxy primer that can withstand prolonged periods of weathering prior to over coating.  For use as a primer for the protection of prepared steel prior to the application of a wide range of products.  Can also be used as a tie coat for application to freshly applied zinc primers to prevent zinc salt formation on weathering and to reduce pin holing of subsequent applied coatings.  Suitable for use with controlled cathodic protection.  For use at new building, Maintenance & Repair or On Board Maintenance. Interbond 201  A hard wearing, surface tolerant, two pack epoxy primer/finish offering corrosion protection in one coat.  A low temperature version of Interbond 201 is available for use down to -5°C.  As an anticorrosive primer/finish for decks, deck fittings and cargo holds.  For use at Maintenance & Repair or On Board Maintenance. HEMPEL BRAND Hempadur Range Hempadur coatings provide excellent long-term protection of steel in even the toughest environments. They are ideal for steel structures and equipment where long maintenance intervals are a priority, such as bridges and other civil buildings, offshore installations, chemical plants and power generation facilities. Our Hempadur range includes primers, intermediates, tank linings and pipe coatings that protect your assets against a range of corrosive elements, from seawater and harsh chemicals to abrasion and high temperatures. Hempadur coatings can be used as primers or intermediates in anti-corrosive coating systems with a polyurethane, acrylic or non-isocyanate topcoat. They can also be used as primers in passive fire protection systems that require advanced corrosion prevention. moderately corrosive environment. It can be used as a finishing coat in engine rooms including tank tops, main engines and auxiliary machinery. Hempalin Primer 12050 Hempalin Primer 12050 is a relatively quick-drying, zinc phosphate primer. It is a general purpose primer for Hempalin systems for protection of steel in mild to medium atmospheric corrosive environments. mechanical damage. It is a "V.O.C. -compliant", versatile, long-term primer on steel for epoxy, vinyl and acrylic coating systems in medium to severely corrosive environments. It is in compliance with SSPC-Paint 20, type 2, level 2 and ISO 12944-5. Hempel Zinc Rich Epoxy Prime 178US A three-component, zinc rich epoxy primer. It cures to a hard wearing and highly weather-resistant coating. It offers cathodic protection of local mechanical damage. It is a "VOC-compliant", versatile, long-term primer in medium to severely corrosive environments. In compliance with SSPC-Paint 20, Type II, Level 2. HEMPEL Epoxy primer H.V 15410 It is a two component polyamide cured anticorrosion epoxy primer, containing zinc phosphate as corrosion inhibiting pigment. It cures to a hard and tough film with highly protective properties. Good adhesion to galvanized steel, aluminium and other metals. It is an excellent holding primer between abrasive blasting and application of the complete coating system. It is used as a general primer in epoxy and polyurethane systems for steel and other metallic surfaces exposed to marine and industrial environments. Sigma Cover 280 Universal epoxy anticorrosive primer, based upon pure epoxy technology.  Universal epoxy primer system suitable for Ballast Tanks, Decks, Topside, Superstructure, Hull and Cargo Oil Tanks.  General-purpose epoxy primer in protective coating systems for steel and non-ferrous metals.  Good adhesion to steel and galvanized steel.  Good adhesion to non-ferrous Metals. Sigma Vikote 56 Modified acrylic finish  Finish coat for above-water areas.  Good gloss and color retention.  Resistant to water and splash of mild chemicals.  Fast-drying.  Can be applied at low temperatures, down to –10°C (14°F). Sigma Cover 630 Two-component, surface-tolerant, highbuild polyamine-cured epoxy primer/ coating.  Surface tolerant coating for lower grade of steel preparation.  Particularly suited as maintenance coating for dry cargo holds, decks and hulls.  General-purpose epoxy buildcoat or finish in protective coating systems, for steel and concrete structures exposed to atmospheric land or marine conditions.  Compatible with various aged. coatings.Compatible with various aged coatings.  Overcoatable with most types of coatings.  Excellent corrosion resistance.  Resistant to splash and spillage of a wide range of chemicals.  Good flexibility. Sigmarine 48 General purpose gloss paint based on an alkyd-modified resin.  Particularly suitable as a finish for boottop, topside, deck and deck equipment.  A quick-drying, hard, tough, water- and weather-resistant coating with moderate gloss retention. SIGMATHERM 175  Can be applied over most intact Heat-resistant modified alkyd aluminum alkyd paints. finish.  This coating is particularly suitable  Heat-resistant up to 175°C (350°F). for areas intermittently exposed to  High-brilliancy. water-immersion and atmospheric  Spray application improves the appearance. conditions.  A minimum drying time of 3 days at 20°C  Also available with non-skid (68°F) should be allowed before exposure to material (supplied separately) for use heat. on deck surfaces. SIGMARINE 28 SIGMACOVER 410 / One-component, quick-drying, high-build AMERCOAT 410 multipurpose zinc phosphate primer Two-component, high solids, high Onboard maintenance primer for abovebuild, polyamide cured epoxy coating water areas.  General-purpose epoxy buildcoat in  Easy application. protective coating systems, for steel  Quick-drying. and concrete structures exposed to  Recoatable with various one and two atmospheric land or marine component products. conditions.  Surface tolerant.  Excellent durability  Good anticorrosive properties.  Can be recoated with various twocomponent and conventional SIGMACOVER 256 coatings, even after long weathering Two-component, high-build, polyamideperiods. cured recoatable zinc phosphate epoxy primer  Easy application by airless spray.  Available in MIO or conventional SIGMACOVER 435 pigmented grade. Two-component, high-build, micaceous iron oxide-pigmented, polyamide-cured recoatable epoxy coating. SIGMAGUARD 720 Reinforced high solids tank coating based upon pure epoxy technology.  Tank coating with good chemical resistance against a wide range of chemicals.  Short curing periods.  Good low-temperature curing.  Easy to clean.